The future location of Amanecer Breakfast Tacos, 512 Main St. Co-founder Ana Vela said the storefront will open in four to six weeks and is the first step to creating a franchise. Amanecer Breakfast Tacos will begin selling tacos in a permanent storefront in four to six weeks and is on its way to building a Chicago area franchise. 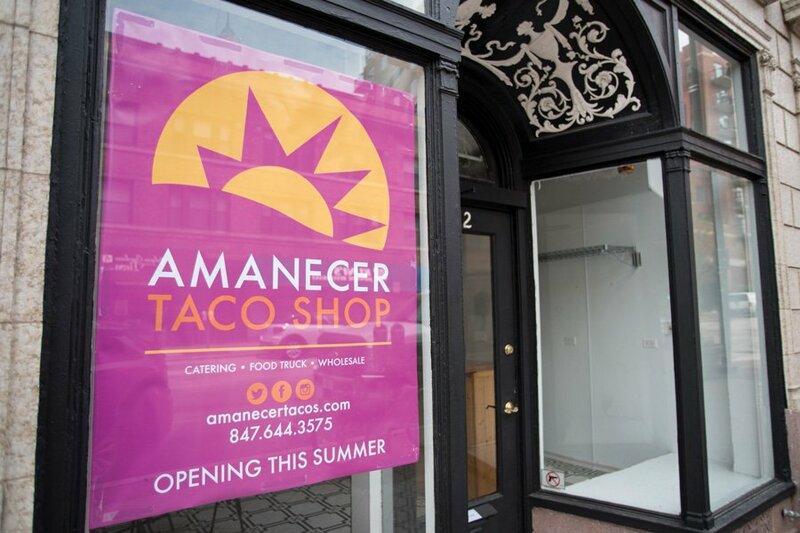 Ana Vela, co-founder of Amanecer — a food truck commonly seen around Evanston — said she receives “three to five phone calls a day asking if the store is open yet.” Starting this fall, the prototype location will be open daily starting at 7 a.m. to satisfy early morning taco cravings. The storefront, 512 Main St., is near CTA and Metra train stops. Although she had no prior food industry experience, Vela used her background in product development and educational publishing to create a profitable business model. For the past two years, she and her husband Mario Vela — director of employer relations for Northwestern’s Kellogg School of Management — have been selling breakfast tacos out of a Smart Car. As part of the taco company’s growth, Ana Vela is also trying to target NU students: She has contacted Sodexo to find ways to bring late night tacos to students on campus and, as the president of Evanston Latinx Business Alliance, has also encouraged student organizations to participate in the alliance’s events. On Sept. 17, the alliance will host ¡Fiesta! Hispanic Heritage Month Celebration, an outdoor event with food vendors and family-friendly activities. Vela said she hopes to see NU organizations there and serve as a role model for minority students. “We’re a new group of Latino business owners in Evanston that we’ve gotten together to bring more awareness that there are Latino business owners out here,” Vela said. Beyond the food truck, Amanecer also sells tacos at Backlot Coffee, 2006 Central St., and Other Brother Coffeebar, 1549 Sherman Ave. To support recovery efforts following Hurricane Harvey, the Velas, who are from Texas, are donating the equivalent of the cost of one taco — $3.75 — for every taco sold at the cafes. All the donations will go to Feeding Texas, a nonprofit organization directing money raised to affected food banks. The effort is separate from Mayor Steve Hagerty’s “Dine and Donate” program, which aims to support nonprofit organizations assisting storm victims in Texas. Backlot Coffee co-founder Isaac Bloom said his cafe, along with Other Brother, sells close to 50 tacos each day. Ana Vela has also contributed directly to Evanston’s community, donating tacos to a silent auction at Lincolnwood Elementary School this spring. And although Vela faced a setback in opening the storefront after Amanecer’s expected city funding was frozen due to the state budget stalemate, she is undeterred.